Peccole-Rainbow Family Park, Las Vegas Nv. 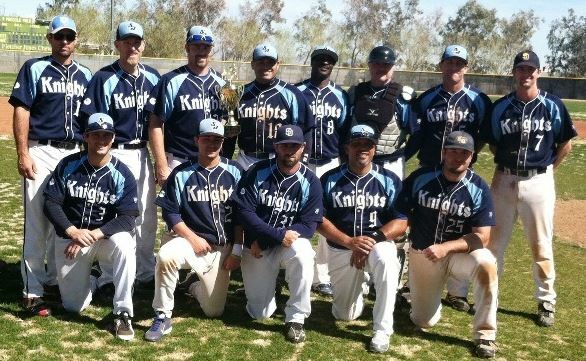 – Ben Bruff tossed a complete-game six hitter with seven strikeouts to lead the San Diego Knights to a 4-1 win over the So Cal Titanes and second straight title at the MSBL’s Kickoff Classic. The game was a rematch of the 2012 finals in which the Knights defeated the Titanes, then known as the So Cal Buzz, 13-2. This time around things weren’t as easy. The game was scoreless until the bottom of the sixth inning when the Knights broke out for three runs — all with two out. Ryan Martin led off with a single but was still on first after two strikeouts. Alex Renteria drew a two-out walk and Mike Lange delivered a single to right to put the Knights on the board. Sean Moran and Britton Scheibe followed with RBI singles of their own. “The way Bruff was throwing, all our guys knew it would be tough for them to come back and grab the victory,” Scheibe said. Defensively, the team played a clean game with Moran getting extra kudos for his work at shortstop in place of the injured Brett Flick. The candle of hope flickered for the Titanes in the eighth inning when Oscar Barreras banged a home run out of the park, but Bruff extinguished it just as quickly. Jason Bendorf, the winning pitcher in last year’s title game, started game two for the Knights, was pulled early when his team reached a 10-run lead, and then threw a complete game in game three – a 4-1 win over the Long Island Senators. Offensively, Scheibe led the team with seven hits (.636) including a double, a homer, and six RBI. Brett Fick (.545) had four doubles and five RBI. Nick Nunez (.444) Moran (.429) and Ryan Martin (.429) were consistent at the plate. The Titanes, formerly the So Cal Buzz, and MezCal before that, almost didn’t play, but a late sponsorship from Mueller Painting’s Enrique Rodriguez and Yvonny Palestino made the trip possible. Team Captain Anthony Bautista said the pitching staff, Gilbert Guzaman, Andy Torres, and Chris Gschwender were catalysts of the team’s success. Gschwender beat a very formidible So Cal Snappers 3-2 in the semifinals. Shortstop Guadalupe Castenon homered twice in that game.